While the recent increase in the headcount is unfortunate, we are still better off compared to the country’s poverty situation from a decade earlier, when it was estimated that close to two-thirds of South Africans (66,6% or roughly 31,6 million people) were living below the UBPL in 2006. The South African economy in the last five years, notably between 2011 and 2015, has been driven by a combination of international and domestic factors such as low and weak economic growth, continuing high unemployment levels, lower commodity prices, higher consumer prices (especially for energy and food), lower investment levels, greater household dependency on credit, and policy uncertainty. This period has seen the financial health of South African households decline under the weight of these economic pressures and, in turn, has pulled more households and individuals down into poverty. Who are affected most by poverty? In general, children (aged 17 years and younger), black Africans, females, people from rural areas, those living in the Eastern Cape and Limpopo, and those with little or no education are the main victims in the ongoing struggle against poverty. 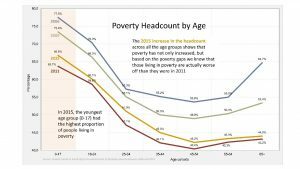 In the figure above, we see that while poverty is highest amongst children (aged 0–17), poverty levels tend to drop as one gets older and only starts to increase again from the age of 55 onwards. 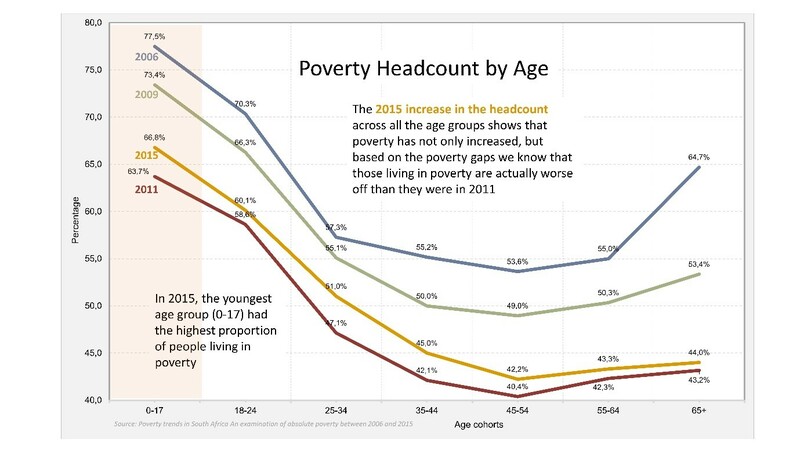 The poverty gap, as well as the severity of poverty, shows a similar trend to the poverty headcount for the 0–17 age group. Poverty gap values highlight that not only are children more likely to be poor but they are also residing in households that are further away from the poverty line. Growing up in poverty is one of the greatest threats to healthy childhood development. Unfortunately, in 2015 this was a reality for over 13 million children living in South Africa according to the latest Living Conditions Survey data. Download the latest Poverty Trends in South Africa report here.